Selling a home during the holiday season can be more of a challenge than during other seasons, but it can be done. The good news is that you’ll have far less competition. 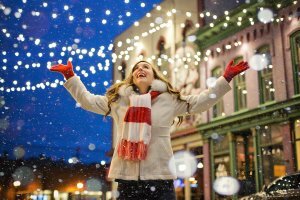 It’s just that staging your house during the holiday season becomes more important than ever because you’ll be competing with lots of other holiday sights vying for buyers’ attention. So here are a few of our best tips for staging your house during the holidays. Most homes have a definite, recognizable architectural style, and staging your house should enhance that style rather than working against or detracting from the style. Say, for example, your home is a traditional style. In that case, you’d want to use vintage or classic holiday-themed staging decorations. Contemporary decorations, on the other hand, would detract from your home’s style. Those types of factors add to your appeal when a buyer walks n the front door. The decorations can add to the appeal or can subtract in subtle ways when they seem out of sync with the home. Also, in staging your house during the holiday season in Floresville, you need to make sure that you draw attention to and accentuate your home’s positive, most attractive features. For example, if you have an large attractive fireplace, you can garnish and decorate it so as to draw buyers’ eyes toward this feature. Or, again, if you have high ceilings (which many buyers want), you can accentuate that feature by things that draw the eye toward to the appealing parts of your home. You have, of course, already eliminated all the brash idiosyncratic colors in rooms and repainted in soothing neutral tones, right? The next step, then, in staging your house is to work toward complementing that color scheme. So in holiday staging, choose accent colors that don’t clash with the color palette, which generally means avoiding a lot of bright Christmas greens and reds. Muted reds and greens as well as complementary blues and neutrals, as well as silver, white, and gold, will work well. Just make sure to keep the accent colors consistent throughout. During the holiday season, days are shorter, the sky is often overcast, and natural light is often in short supply. So an important part of staging your home is getting down those heavy drapes and light-obscuring blinds. Also, make sure there is plenty of artificial lighting in your home so that buyers can actually see all the effort you’ve put into staging. And don’t forget to light a fire in the fireplace for some cheery light. Light is always important when showing your home. Don’t forget that staging your house during the holidays also includes the outside of your home. Curb appeal is important no matter the season. So go easy on all those bright, garish, multi-colored lights and inflatable figures. 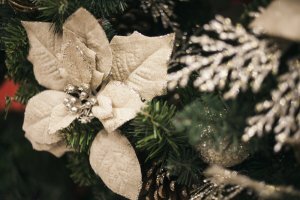 Strive for holiday elegance instead with white lights and natural elements like pumpkins, greenery, and seasonal flowers such as poinsettias. Even though many of the holidays during this season are religious holidays – Christmas and Chanukah not all people celebrate as such. Things like evergreen branches, wrapped gifts, and fall/winter objects appeal to all. But don’t overdo it. Too much of anything even collections can overwhelm people viewing your home. Although you’ll have less competition when selling your home during the holidays, there will also be fewer buyers out and about. The good news is that these buyers are usually highly motivated. Still, great showings are a crucial ingredient for successful selling. And remember anyone out looking during the holidays is a motivated buyer.